Your glossy A4 photo book can be anything from a magazine, portfolio, company brochure and even a unique photo album gift. With 40 sides of high-quality acid-free paper to personalise with your photos, designs, patterns and stories, you can easily create a stunning soft cover photo book that has been hand bound to last a lifetime. These 40 paged A4 portrait photo books are so versatile and can be used in many different situations. Made from glossy acid-free FSC certified paper and hand bound using traditional bookbinding methods, they'll last a lifetime. Whatever creative vision you have, the covers and pages are blank for freestyle design, so you can bring it to life in full-colour edge-to-edge long-lasting print. Although I found the software complicated to use, once I got the hang of it I was ok ( think I'm a bit of a novice really!) However I was delighted with the finished product. A splendid Memorial Book for my Best Friend's family to keep forever. Very impressed by quality of print and paper. Fast delivery, helpful service. Website is very easy to use. The photobook quality was first class and arrived very quickly. Our recipient was overjoyed with this gift. If you're looking to start up a magazine, or are running a one-off edition, these A4 photo books are the perfect solution. With glossy pages and totally unrestricted in regards to layout and design, you can watch your journalism come to life. There's no minimum order either, also ideal if you're looking to run a prototype. For an alternative gift, turn this into a unique photo album to give to your friends and family. Filled with pictures from the past, funny stories and sentimental messages, this will make an amazing 18th birthday photo book, 21st birthday photo book and 40th/50th birthday photo book. Because it lasts a lifetime, it's the ultimate keepsake. Make a professional presentation of your creative work, whether that be photography, art, modelling or writing. Presented in this glossy portrait book, it's an impressive and stylish book that's guaranteed to stick in people's minds. Impress delegates at corporate functions, create marketing collateral for customers or simply create a product brochure to add to your business' creative media assets. Print your logo, branding, contact details etc and spread awareness. 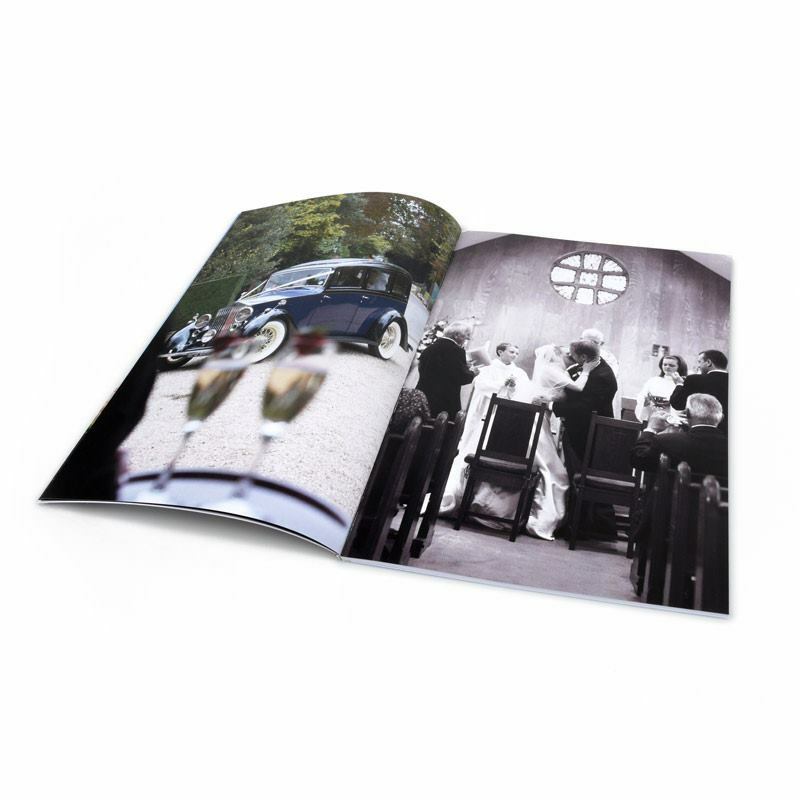 Like many of our products, the A4 photo book comes with a quantity discount, ideal if you're printing a bulk of magazines, or have several people's birthdays to create something special for. Buy more than one today and save money. Your photo book is a folio in that we fold one sheet of paper to create four sides, a classic bookbinding method. We print your designs using a specialist process that bonds the ink to the paper, meaning nothing will scratch off or peel away. Everything is made by hand by our artisan bookbinders in London, UK. On the top, bottom and right-hand side of each page, there's a bleed area to keep in mind. Make sure no text or important photo details run into the bleed area as this will be cut out not printed. Other than that, the photo book is entirely yours to customise. All pages, front cover and back cover are blank to fill with whatever you desire.